HUNGARY’s highly-ranked Zoltan Kovacs arrived in Namibia on Monday in preparation for his WBO Global International Lightweight title fight against Jeremiah Nakathila at the Windhoek Country Club on Saturday. Both boxers are ranked amongst the top 15 super lightweight fighters in the world by the WBO and the victor will have a good chance of challenging for the WBO world super lightweight title soon, according to promoter Nestor Tobias of the MTC Sunshine Boxing Academy. “It’s going to be a great fight. We have two boxers ranked in the top 15 in the world and it’s not easy to get such high profile fights, so for me as a promoter it is also a great achievement,” he said. “Hopefully the winner will get a mandatory shot at the WBO world super lightweight title, so it’s a great opportunity for both boxers,” he added. Kovacs has a record of 23 wins, one draw and five defeats, but most of his defeats came early in his career, with his last loss coming five years ago. 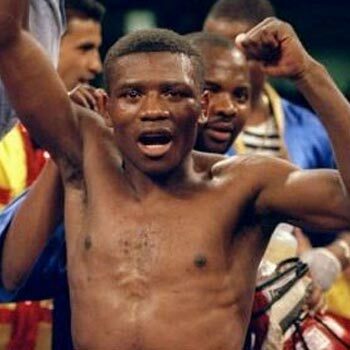 Since then he has remained unbeaten in 13 fights, while he also claimed the WBO European super featherweight title along the way. At a press conference in Windhoek on Monday, Kovacs’ manager Felix Racz said they were looking forward to the fight. “We just arrived at the airport at 08h30 so we are still tired, but we feel good. Thanks to all of the sponsors for putting up this fight – the winner will have a good chance to fight Masayuki Ito for the world title,” he said. “We saw Nakathila’s fight against the Russian (Evgeny Chuprakov) – he is a good fighter, but Zoltan has been preparing for this fight for 10 weeks, so he’s in great shape and ready for the fight,” he added. Kovacs is currently ranked 15th in the world by the WBO and 13th by the IBF, and according to Racz, his ranking would have been even higher if it was not for an injury that he sustained in 2017. “We don’t want to disrespect Nakathila, but we have fought at a high level. Zoltan became the European champion in 2016 and he has improved since then. “After winning the European title he was ranked sixth in the world, but then he got injured which put him out of action for about 10 months, so his ranking dropped. If it wasn’t for that he would be ranked much higher now,” he added. The two boxers will be fighting for a new belt on Saturday, the WBO Global International Lightweight title – which was recently added to the growing number of international boxing titles. Tobias, however, said that it would give the winner a good chance to challenge for the world title. “All these titles are for the boxers to get better world ratings. It’s the same level as an International title, while it also gives a boxer a chance to fight anywhere in the world and not just in Africa,” Tobias said. “We’d like to invite the whole nation to come and support Jeremiah. The entrance is N$200 for general tickets and N$10 000 for a VIP table of ten,” Tobias added. PreviousPrevious post:WATCH: MANNY PACQUIAO’S SON MAKES PRO DEBUTNextNext post:DOGBOE: I’LL MAKE NAVARRETE EAT HIS WORDS!